Climate is a paradigm of a complex system. Analysing climate data is an exciting challenge, which is increased by non-normal distributional shape, serial dependence, uneven spacing and timescale uncertainties. This book presents bootstrap resampling as a computing-intensive metho... read full description below. Climate is a paradigm of a complex system. Analysing climate data is an exciting challenge, which is increased by non-normal distributional shape, serial dependence, uneven spacing and timescale uncertainties. This book presents bootstrap resampling as a computing-intensive method able to meet the challenge. It shows the bootstrap to perform reliably in the most important statistical estimation techniques: regression, spectral analysis, extreme values and correlation. 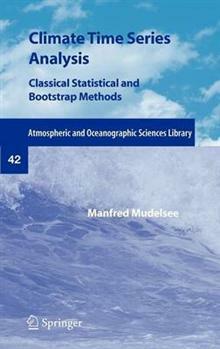 This book is written for climatologists and applied statisticians. It explains step by step the bootstrap algorithms (including novel adaptions) and methods for confidence interval construction. It tests the accuracy of the algorithms by means of Monte Carlo experiments. It analyses a large array of climate time series, giving a detailed account on the data and the associated climatological questions. This makes the book self-contained for graduate students and researchers.